Gothic Tourism (2016; Emma McEvoy). Review by Jennifer Wallis. 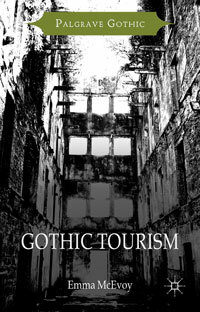 Gothic Tourism is one of several books published as part of the ‘Palgrave Gothic’ series, aimed not only at academics but a more general readership. Here, author Emma McEvoy examines everything from waxwork museums to ghost walks to ask what Gothic tourism is and how Gothic works as a touristic mode. To clear up the first question straight away, McEvoy defines Gothic tourism as ‘the act of visiting, for the purposes of leisure, a location that is presented in terms of the Gothic … the Gothic that came into being in the mid-eighteenth century’. There is something tragi-comic about many of the attractions detailed, including Strawberry Hill. There, in the Little Cloyster, one could see the large vase in which Walpole’s cat had drowned—an event immortalised in Thomas Gray’s poem ‘Ode on the Death of a Favourite Cat Drowned in a Tub of Goldfishes’. This use of a single object to tell a story is a recurring feature of Gothic, a trend used to rather darker effect in Madame Tussaud’s waxworks. There was something unnerving, and uncanny, in Tussaud’s practice of including real relics in their tableaus. One tableau of ‘Mrs Pearcey in her sitting room’ —a woman who had murdered a love rival and her young daughter in 1890—contained much of the furniture from the room itself. Tussaud’s had purchased this from the crime scene—even, they boasted, the perambulator in which Pearcey had wheeled the bodies out of her kitchen. This disturbing realism is subverted by Dennis Severs’ House, a twentieth-century London attraction set up as the home of an imaginary eighteenth-century family. In Severs’ House, visitors get the sense that the occupants have just left, with smells, sounds, and moving objects creating the impression of a hasty departure. The House operates on the basis of a fabricated authenticity, the visitor confronted at every turn with signs of the slightly ghostly inhabitants. McEvoy convincingly argues the case for Severs’ House as a kind of faux Gothic, but the other examples covered in her chapter on London attractions sat, for me, less easily within the narrative. The Clink, London Dungeon, and the Necrobus all sell themselves with their tongues firmly in their cheeks, and it is difficult to see the rather schlocky Necrobus as a Gothic site in the same vein as Strawberry Hill or Madame Tussaud’s. The discussion of these modern ‘entertainment Gothic’ sites, though, perfectly highlights the performative aspect of Gothic. Often, these are performances that directly involve the visitor; at ‘Scream’, Madame Tussaud’s ‘scare attraction’, visitors are sprayed with water and accosted by actors playing unhinged prison inmates. The most interesting of the modern-day attractions that McEvoy examines, though, are the rather more sedate ghost walks. It is in analysing a number of ghost walks in different English towns that the importance of place to Gothic is most clearly brought out. Again and again, ghosts ‘cling’ to similar places—they are especially fond of pubs—telling us a great deal about a town and its people. Local ghost walks are closely engaged with local history — indeed, one of the walks examined here is explicitly imagined by its organiser as a history tour hung on the narrative hook of the ghost story. Throughout the book, we get the sense that there is something distinctly ‘English’ about Gothic—the French were, according to Walpole, notably underwhelmed by Strawberry Hill. McEvoy explains how eighteenth-century understandings of ‘Gothic’ were bound up with liberty—with the freedom to make oneself or one’s surroundings ridiculous, and to push the boundaries of self-expression. Confidence in architectural style or interior decoration reflected, she argues, Britain’s status as a world power. Strawberry Hill, though, attained new or ‘enhanced’ Gothic status when Walpole was revealed to be the author of The Castle of Otranto (1764) and visitors began to read the house through the book’s pages. I have to confess to struggling with the various definitions of Gothic that Gothic Tourism addresses. There is the ‘‘Gothick’ inflected with ‘Gothic’’ of heritage tourism, which re-contextualises objects to frame the past in a particular way—such as the ‘Duchess’s musaeum’ of Alnwick Castle. There is ‘family-friendly Gothic’ (at festivals), ‘municipal Gothic’ (at the Showzam! circus and magic festival), and ‘consuming Gothic’ (at Glastonbury festival). Although the structure of the book is calculated to take the reader on a non-linear, thematic, journey through Gothic tourism—from the objects of Strawberry Hill or Tussaud’s through to the performances of ghost walks and theatre—the movement between time periods is sometimes jarring. Moving from the chapter on ghost walks to that on Berry Pomeroy Castle, I felt like I’d taken a step backwards in the narrative, with the literature inspired by Berry Pomeroy echoing the earlier discussion of Strawberry Hill and The Castle of Otranto. But this is entirely in keeping with Gothic sensibilities—as McEvoy points out in her chapter on Gothic and the heritage industry, ‘Gothic has often … gone hand in hand with a lack of historical specificity’ and the dislocation of time and space. In appealing to eighteenth and nineteenth-century legends and fictional accounts even as it places visitors at the heart of the action, Gothic persistently disrupts temporal boundaries to enhance its uncanny effect. Gothic Tourism covers an impressive range of sites in its tour of English Gothic, raising tantalising questions along the way that are ripe for further work. McEvoy’s concluding remarks to the ghost walks chapter, for example, on the ghost walk as a ‘communal, celebratory act’ suggests that they are a form of tourism with much to say about cultural memory and local history. I was also intrigued to know how Gothic tourism might operate in smaller-scale, less well-known attractions, such as the Whitby Dracula Experience. McEvoy makes a convincing case for tracing the Gothic of Strawberry Hill to the ‘so highbrow that it is not even usually called Gothic’ of Dennis Severs’ House. As she concludes, Gothic—in its various incarnations—sells, but that sale depends on a sense of authenticity, even if that ‘authenticity’ is a recently constructed one. Gothic Tourism is a valuable—and highly readable—addition, then, to histories of tourism as well as the history of geography, shedding light on the places that capture our imagination, that fascinate, and that sometimes draw us in too close for comfort.